It’s only the first weekend but some players have already caused some loud stir, from corners of the goalpost to the corridors of midfield. Superstars took center stage and gave nothing away, for the 2018/2019 season, we present the very first team of the week. A few goalkeepers deserve mentions this week, Petr Cech made incredible saves to keep the score at a moderate two nil as City went on a rampage at the Emirates. Wayne Hennessey saved severally from Fulham but from nothing to something, give it to Joe Hart, beyond the clean sheet, the almost forgotten former England number one rose to the occasion as Southampton went for the broke to earn a point on his debut for Sean Dyche’s Burnley. Crystal Palace enjoyed a sharp contrast to their 2017/18 season with a commanding 2-0 success over new boys Fulham, while it was another promoted team that destroyed them a year ago on their own pitch; they took advantage of their chances and did in fine fashion. Young full-back, Wan Bissaka shone like a million stars in defense, kept a clean sheet and even weighed in with a sleek assist to tee up Wilfried Zaha for the second goal that seal the victory. Manchester City had moments of uncertainties against Arsenal, they dominated for most parts but there were times Ederson had to make saves and the defense was well tested especially when Lacazette was introduced for the North Londoners. His composure was key in making sure that Arsenal didn’t get a goal that could have unsettled the Citizens. Whatever it was that Jose Mourinho has against the Ivorian defender must be dead and buried now, United conceded late on from a fortuitous Vardy rebound but the hard work of Eric Bailly can’t be underestimated. Kelechi Iheanacho was twice denied by the quick thinking of the United defender and he was also a threat at dead balls situations, if he stays fit, he will be key for the Red Devils this season. Power, pace, and precision, that was Benjamin Mendy on Sunday at the Emirates, the World cup winning full-back was in a very lively mood as Arsenal suffered a 2-0 defeat in the hands of the reigning champions. Mendy was active all afternoon long, attacking and defending with lots of intelligence, he got into this list at the expense of Patrick Van Aanolt and Marcos Alonso who both weighed in well for their teams, but bouncing back from a difficult start with Belerin caught lots of eyes for Mendy. 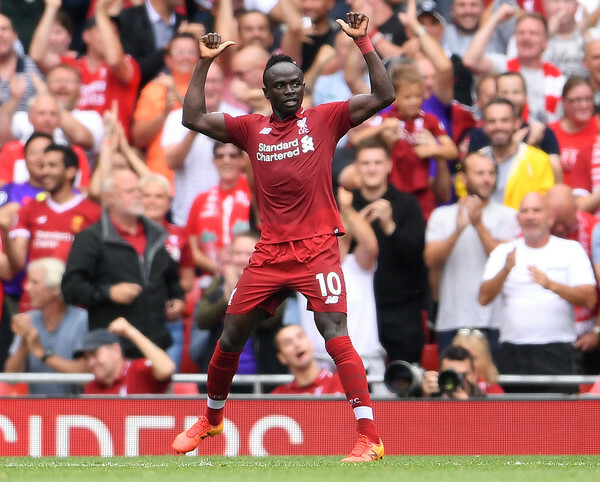 What a way to introduce yourself to the Premier League, commanding, agile and accurate, Naby Keita was instrumental to Liverpool’s routine win over Westham at Anfield on Sunday. The confident manner in which Keita rules the midfield shows there are little worries for the Scoucers in the absence of long-term injured Chamberlain, the former Leipzig playmaker meandered through the pitch and showed why he was worth the wait. While many would question the decision to hand Paul Pogba the armband on Friday night, the big French midfielder wasted no time in showing leadership skills, from taking responsibilities as early as the second minute when he stepped up to blast in from the spot after Amartey handled the ball in the box. Pogba was brilliant on the night and his impact was felt more when he was substituted, a telling fact for a certain Portuguese at the helm at Old Trafford. 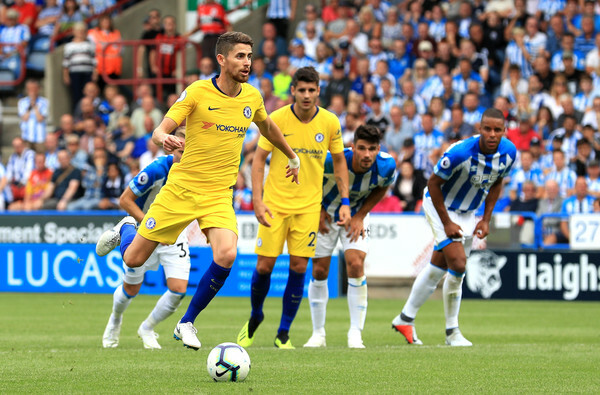 Another debutant proved himself on an opening day in the person of Chelsea’s midfield general, Jorginho, the intelligent Italian marauded the Huddersfield midfield like no one was there, his cheeky penalty may have dumbfounded Chelsea fans at the time but his confidence speaks volume of his abilities. With Kante and Hazard in the same team, Chelsea will have no problems from the middle. Ruben Neves is another name we should be talking about but the new boy got the nod ahead of the Wolves midfielder. You can’t score twice like that and not get a mention, simple tap ins but positioning and composure say it all for the Senegalese forward. All eyes were on Mohammed Salah, the Egyptian didn’t disappoint, he was all up in Westham’s faces but it was the runs of Mane behind the defense that caused the most damage on the day, now opponents know they have more problems than one in the colours of Liverpool. Everton fans must by now have stopped questioning the decision of their new manager to pursue a 50million player in the young Brazilian, the former Watford forward blew Wolves away with pace and trickery. He scored a brace to hand ten men Everton a point after Phil Jagielka was sent off for a professional foul on Jimenez. The sky is really blue for Everton this season with their flying Brazilian on top form. The loss of Richarlison to Everton was made light by the sensational form of Roberto Pereyra on Saturday in front of the Vicarage Road fans. Watford beat Brighton and Hove Albion 2-0 to start the season on the front foot, now the fans can pick another hero to champion their cause for the new season. Pereyra scored twice on either side of the halves and looks like the real deal for the Hornets going forward. Crystal Palace went away and beat Fulham at Craven Cottage, not a news really but whoever remembers the tales of the Eagles last season where they lost their first seven fixtures without scoring a single goal will know they have improved in confidence and quality.